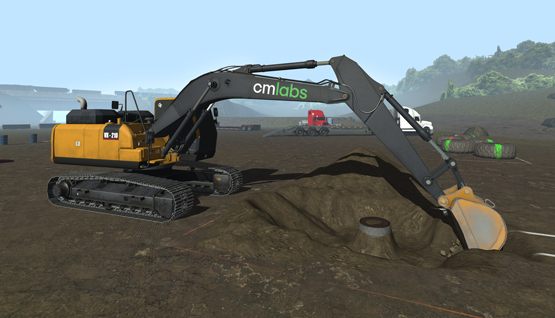 Montreal, QC, August 28, 2018 — CM Labs Simulations today announced the release of an Excavator Simulator Training Pack that features the world’s first commercial application of an innovative new method of soil simulation. CM Labs’ new Excavator Simulator Training Pack leverages simulation and visualisation research that received the top presentation award at I3D, the international conference for real-time 3D computer graphics and human interaction. This realism immerses trainees in a virtual environment that promotes rapid skills acquisition — from excavating and trenching, to trailer loading, safety corridor management, and more. By training operators in this virtual world, organisations will see reduced wear and tear on their equipment, while simultaneously reducing risks to trainees and other personnel. Designed for deployment on any Vortex simulator, CM Labs’ Excavator Simulator Training Pack has been approved by professional excavator operators as a learning platform that behaves and reacts just like the real equipment. The Excavator Simulator Training Pack focuses on the three training pillars of safety, technique, and efficiency. While it automatically detects safety violations — including contacts with power lines or people, hazardous load trajectories, and turnovers — it also captures objective scores to indicate technical proficiency, including completion time, movement efficiency and accuracy, bucket efficiency, and more. 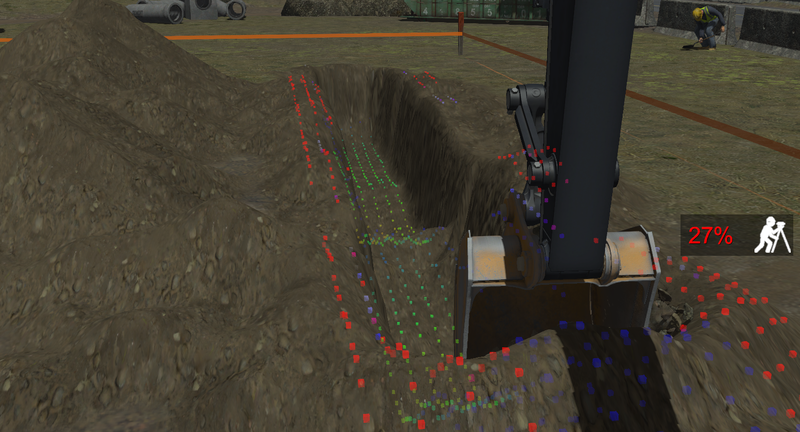 The training pack’s high-quality visuals include realistic worksite and machine graphics, as well as award-winning soil graphics that are the result of decades of academic research. This realism engages trainees in a learning experience that translates directly into worksite skills, explains Lisa Barbieri, CM Labs’ VP Marketing. The training packs’ advanced learning tools include a Grade Quality Sensor (GQS) overlay, which provides visual indications to operators as a reminder to maintain a safety corridor on both sides of the trench. The GQS can be activated at any time during the exercise. In addition to real-time feedback on excavation height, slope, and consistency, the GQS will also provide an overall excavation performance score to operators. The new training pack also introduces a “sandbox” exercise that allows operators to refine their skills by excavating near a water pipe or manhole, lifting tires, or manipulating a trench box or gravel box. In addition, operators and instructors can change the time of day at any moment during the exercise in order to practice for nighttime operations. They can also introduce inclement climate conditions, which can be difficult or impossible to recreate in a training yard. The Excavator Simulator Training Pack is part of CM Labs’ extensive product line of earthmoving and lifting crane training packs, all of which can be run from a single Vortex simulator. Solutions range from training packs for crawler crane, flat-top tower crane, luffing tower crane, and mobile crane, to backhoe, wheel loader, motor grader, and more. For over 20 years, CM Labs’ Vortex simulators and services have helped train crane and heavy equipment operators all over the world. Today, CM Labs is the largest simulator vendor in the market, with over 1,000 simulators in 30 countries deployed with Vortex software. CM Labs’ feature-rich Vortex Simulators provide immersive, ultra-realistic learning environments that promote increased safety and operational efficiency, essential skills development, and reduced training costs. Developed by operators, instructors, and simulation experts, our standards-based solutions prepare operators for the real world. Our clients include IUOE, Kiewit, Liebherr, Mammoet, Manitowoc, NASA, and over 100 other world-class companies, OEMs, equipment operators, and trades training organizations. For more information, contact info@cm-labs.com, or visit www.cm-labs.com.